Prior to 1988, Canadian individuals, corporations or organizations in general who wished to have lawful armorial bearings were required to petition Queen Elizabeth II’s traditional Heraldic officers at the College of Arms in London, England. On June 4, 1988, by Royal Letters Patent, Her Majesty graciously transferred the exercise of her heraldic authority and prerogative to the Governor General of Canada. Today, a new Canadian Heraldic Authority exercises complete heraldic responsibility in Canada. Clyde River Community, through its Council, as approved at the Annual General Meeting, petitioned the C.H.A. (Canadian Heraldic Authority) to carry its own armorial bearings. Permission has now been granted and the Coat of Arms designed and approved. The motto on the Coat of Arms is jointly “Oigreachd: Heritage”. Oigreachd is the Gaelic word for “Heritage”. Gaelic was once spoken by many of the early settlers. A few of their descendants today can still recall the language being spoken at home. The Coat of Arms includes a sheaf of wheat to denote local agriculture and a horseshoe indicative of local horse breeding and harness racing. It also has an oak tree. This provides a nice link between Prince Edward Island and the Clyde in Scotland, which also has an oak tree in its Coat of Arms. Another link is a blue and white band (or fesse in heraldic terms) which portrays the local River Clyde and the “parent” River Clyde in Scotland. The crest is a unicorn, again a link to Scotland. The unicorn was the traditional heraldic beast of Scottish monarchs and was incorporated with the Royal Coat of Arms in 1603 under James I of England and James VI of Scotland. Also on the crest is a suspended purple Celtic Cross, suitably recalling the long-standing association of the community with the church. The mantling around the Coat of Arms acts as supporters; it is green and yellow, representing the familiar green foliage of our Island and its yellow sands. 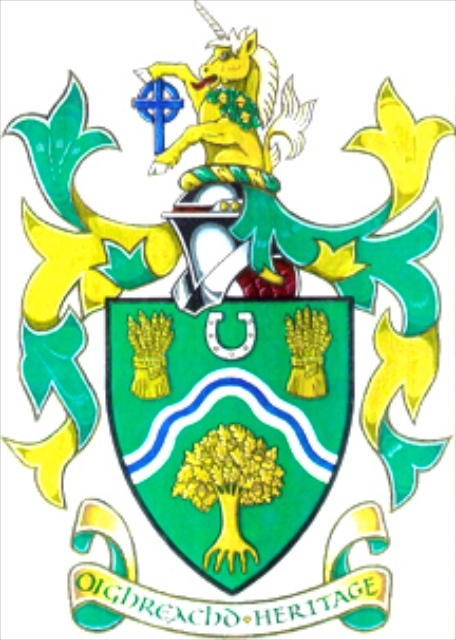 On November 18th 1994, a ceremony to unveil the Clyde River Coat of Arms was held at the Riverview Community Centre. The project was spearheaded by Councillor Edward Edmonds who worked diligently to research and initiate the formalities necessary for a specific coat of arms. Thanks to Dr. Edmonds, Clyde River was the first community on Prince Edward Island to have its own official coat of arms. Honourable Marion Reid, Lieutenant Governor of Prince Edward Island at the time, unveiled the Coat of Arms. Born in England, Dr. “Eddie” Edmonds studied under C.S Lewis while at Oxford University, earning his BA and master’s of arts. He also earned a master’s of education from Sheffield University and his PhD from Leeds University along with a number of university diplomas in literature, teaching, public administration, and educational administration before moving to Canada. After teaching and serving as a department head at the University of Saskatchewan, Dr. Edmonds came to the newly constituted University of Prince Edward Island, becoming the first dean of education. Dr. Edmonds is widely published, with many books to his credit (including two of poetry) and was recognized in later years for his long-time dedication to teaching history classes to seniors. He was a long-standing fellow of the Royal Historical Society, knight of the Order of St. John, an honorary citizen of Texas, and served and held leadership positions in a number of professional, community and charitable organizations. Interesting post. Greetings from Greenock on the River Clyde in Scotland.